Graduation is the process whereby smooth mortality rates are created from crude mortality rates. Smoothness is an important part of graduation, but another is the extrapolation of mortality rates to ages at which data may be unreliable or even non-existent. An example would be pension-fund work where reliable mortality-experience data might be available up to age 100, but where actuaries required mortality rates up to age 120 (say) for the purposes of calculating pension reserves. An illustration of this dual smoothing and extrapolation is given in Figure 1. Figure 1. log(mortality) by age for males in United States of America. 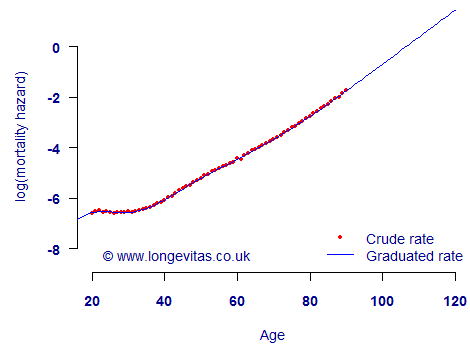 Crude rates shown for ages 20–100, together with graduated rates outside this range. The graduation process behind Figure 1 used penalised splines to perform the smoothing and extrapolation simultaneously. The downloadable ZIP archive on the right contains a simple R script for the graduation of a mortality table from experience data. A default upper age is set to have simultaneous extrapolation of mortality rates to ages beyond the observed data. 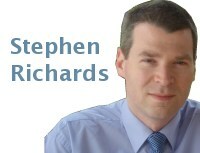 R can be downloaded free of charge from the R website. If you need assistance in installing or running R, please see the list of frequently asked questions (FAQs). This is free software and neither Longevitas Ltd, Stephen Richards nor Iain Currie can supply support in installing or running R.
Update for 2012-11-27: We have made some minor changes to the documentation of the R script. Details are logged in the change history.